Pasta Carbonara has been on "Mike's List" for a while now - it was his favorite meal when we were in Italy for our honeymoon. I've been shying away from making it because I thought, bacon, cream, cheese... do we really need that? Then I thought about how I could make it a little healthier and more Summer appropriate... roasted chicken, fresh basil? What is your favorite splurge? Sweet or Savory? Heat water to boil for pasta. Add 2 tablespoons of sea salt to the water. In a large saute pan, brown pancetta on medium high heat until crispy. Remove from heat. In a small bowl, whisk together eggs and whipping cream. Set aside. Do not begin to make the rest of the sauce until the chicken has finished roasting. Add pasta to the boiling water. Shred the chicken with a fork. Add minced garlic and chicken to the saute pan with pancetta. Cook on medium for 1 minute heat chicken and saute garlic. The pasta should be just about ready. Remove it from the boiling water (I recommend tongs!) keeping the cooking water in the pot, and place it directly into the saute pan with the chicken and pancetta. Reduce heat to low. Pour egg and cream mixture over the hot pasta and stir continuously until the sauce thickens. If you need more liquid, add a small amount of the pasta cooking water. Add parmesan cheese, chopped basil and some black pepper and toss together. Serve immediately. I have the deli counter slice the pancetta pretty thick to have something nice to bite into. Shred the chicken with a fork. I think that roasting the chicken, instead of poaching it gives it much more flavor. In goes the pasta... this is a smaller recipe for one. You'll need a very large skillet for 1 pound of pasta... unless you like scrubbing your range. This looks delish! Putting it on our menu for this weekend. Yummmm! Making this as a special birthday dinner for my sister's 40th. Thanks for the inspiration. I just made this tonight for dinner, and it was absolutely delicious. I am glad there were just 2 of us eating, so we will have plenty of leftovers tomorrow! yum is right! I can't wait to make this for dinner tomorrow night. man does it look delicious! perfect for hungry teens after football practice! .I can't hold out to make this for supper the next day evening. man does it look delicious! ideal for starving teenagers after soccer practice! 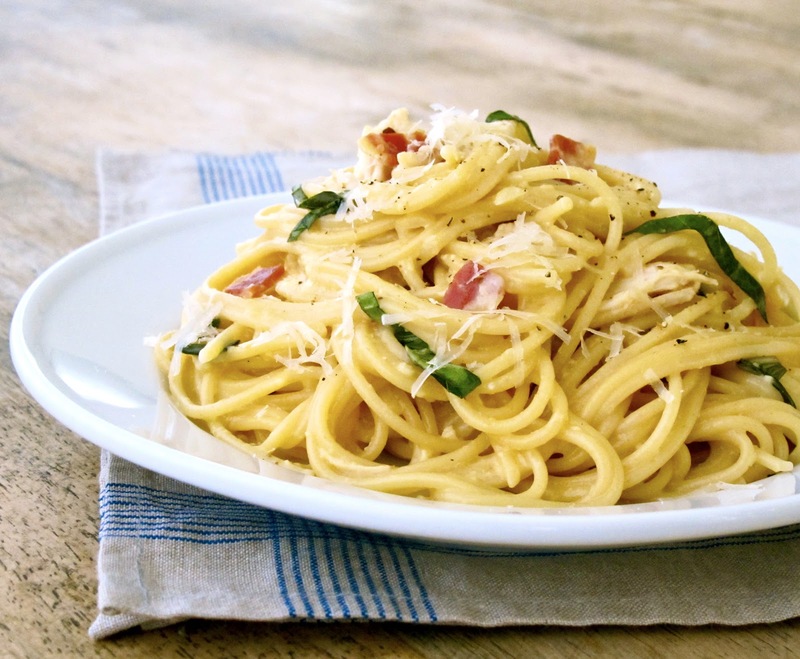 I prefer tomato-based sauce but once in a while, carbonara is good!